Simon & Schuster/Paula Wiseman Books, 9781442450714, 40pp. As the manic animals from Warning! Do Not Open This Book! (2013) return, now exhorting readers not to close the book. A monkey with a lantern illuminating ink-black pages rejoices: "You opened the book. We're saved!" 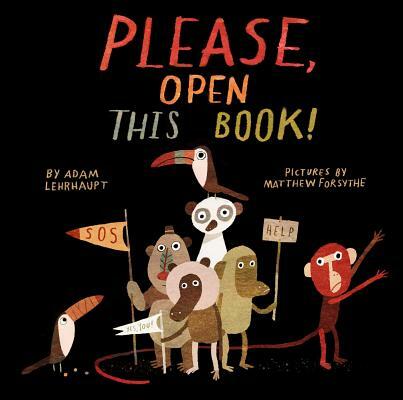 Illustrating many of the terrible things that can happen when a book is closed, Forsythe produces an alligator in a cast, a toucan with a bandaged beak, and a frightened lemur peeking from a box. A battered banana is proffered as further evidence. Stalling readers from reaching the book's end, the narrator offers to change the story. "We'll write something with a hero and heroine. You'll like it. It will be a good story!" Amusingly, the earth-toned, digitally composed illustrations depict a gorilla hunkered over a typewriter; strewn about are drafts whose only word is "banana." More bribes (that banana, now half-eaten) naturally won't deter readers from turning the pages. The panicky monkey laments: "One more page and… // THIS BOOK WILL BE // …CLOSED!" This anguished word winds up on the back cover, with small-print instructions: "You can fix this. Flip it over and…." The metafictive silliness will require the suspension of disbelief: if a closed book could hurt its characters, wouldn't a page turn inflict some minor injury?